By Cameron Gillon: Former World Boxing Organization (WBO) light welterweight champion Ruslan Provodnikov looks set to return to the ring in late November on the 28th in Moscow, Russia. However, his opponent is still yet to be confirmed. It is looking highly likely he will be put against 40-year-old veteran and former WBC lightweight world champion Jose Luis Castillo (66-12-1, 57 KOs). Provodnikov is coming off a 12 round unanimous decision loss to unbeaten American Chris Algieri last June at the Barclays Center in Brooklyn, New York. 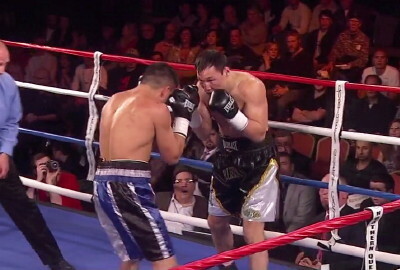 Provodnikov went into that fight a big favorite, but fell short to Algieri. Provodnikov had Algieri down in the 1st round twice which resulted in Algieri having a completely swollen right eye for majority of the rest of the fight. Provodnikov has recently stated he would like a rematch with Algieri after Algieri’s next bout with Manny Pacquiao. If Algieri beats Manny Pacquiao it is highly unlikely you will see Algieri give Provodnikov a rematch as he would of put himself high above into the elite fighters of boxing with a win over Pacquiao and Provodnikov back to back. If Algieri loses potentially he could come back down to light welterweight and try to regain the WBO 140ib title he has to vacate to have the fight against Pacquaio. Onto the possible fight between Provodnikov and Castillo, although a win over Castillo would be a good win because of how big Castillo is, you have to feel many would consider this a poor fight made by Provodnikov’s management. Castillo hasn’t been relevant for a long time. Yes, he is still active, but Provodnikov is a younger, stronger fighter than Castillo and everything seems to add up in Ruslan’s favor. I would rather see Provodnikov face a rematch with Timothy Bradley or a fight against Brandon Rios.